The Ten of Cups is the most uplifting tarot card – because it points to happiness in general – not in personal but in a more family oriented way. 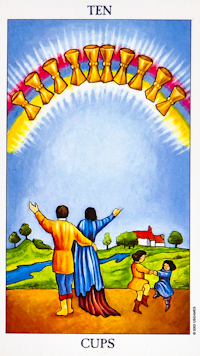 In a psychic tarot reading, even if you are single the Ten of Cups speaks of a happy family life and to general well being that goes beyond yourself to include those that you are most concerned about: parents, siblings, etc. Being spiritually fulfilled is also part of the picture here. Share the wealth that you have amassed with your love ones, in whatever way makes you feel comfortable. In a spiritual reading this card says: Live in the moment and seize the day. You will be all but radiating very good energy and good attitudes. It’s important that you share these good attitudes with the people around you who are down or who need this positive energy. The Ten of Cups shows that you have reached a degree of being indispensable in your current work. You seem to be on the right track, just don’t sit back and rest on your laurels. Keep plugging ahead. You and your beloved are on the same page. Commitment is next, bringing spiritual wellness.